The debate in the European Parliament on the new European Union (EU) Directive on Air Pollution scheduled for 25 September, and the vote expected shortly thereafter, will prove a decisive test of your green credentials. 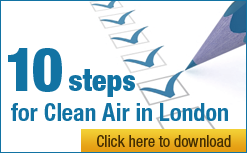 We will be looking to see, in the new EU Directive on Air Pollution, that you have delivered results against the package of 12 commitments sought by The Knightsbridge Association and many other amenity societies in Central London (please use the link below to find a summary of the package). Most importantly, we want equal environmental rights for all to be enshrined explicitly in the new EU Directive and no postponements from the meeting of current EU legal limits and timetables (which have been in place since 1999). In respect of particulate matter (PM10), for which EU legal limits were breached in 2005, we expect to see tough penalties and a robust regime to deliver early compliance with World Health Organisation recommended levels of air quality. We gather that a compromise is being sought that might allow four year postponements from meeting 2010 EU legal limits and allow a six year postponement for PM10 (to 2012). Worse still, there are no precise backstop dates since the starting date would depend on when the new EU Directive came into force. Please do not think it is acceptable to “trade-off” the timetable for meeting PM10 legal limits, or to concede any delay in meeting the existing 2010 deadline, with the introduction of a new regime for fine particulate matter (PM2.5). On behalf of all Londoners, we urge you to take a tough line in negotiations with each other and with other European countries – particularly the Germans who are rumoured to be seeking a weak and flexible new regime for air pollution to replace the current five EU Directives dealing with air pollution. The London Mayor has estimated that 1,031 premature deaths occurred due to PM10 pollution in London in 2005 alone with another 1,088 people predicted to have been admitted to hospital with respiratory problems and many more suffering from impaired health due to air pollution. This is not a subject for “trade-offs” and compromise. The new EU Directive on Air Pollution represents a simple and clear test for all political parties of their green credentials and their willingness to take responsibility and the tough decisions necessary for the protection of Europe’s citizens.